Place the fine egg noodles in a pan of boiling water and cook for 3-4 minutes, until tender, or according to the packet instructions. Heat a wok until very hot. Add the oil and swirl it around the edges, then tip in the red pepper, green beans, baby corn and garlic and stir fry for 3-4 minutes, until the vegetables are tender, sprinkling over 1 tablespoon of water if the mixture is getting too dry. 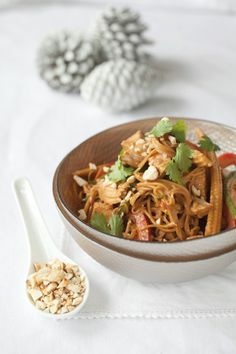 Drain the noodles and add to the wok with the coconut milk, turkey, peanut butter, soy sauce, chilli sauce, sugar and lime juice. Stir fry for another 2-3 minutes, until all the ingredients are piping hot.